"Palm Creek can be so much more than a destination resort, or a championship golf club and spa! 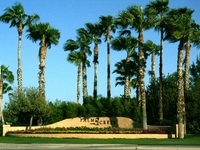 It's a community and lifestyle designed to appeal to your most treasured and basic desires. An oasis in the warm desert climate, it's the place to relax and enjoy the best times of your life. Cultivate new friends. Kick up your heels with an exciting active social life and pursue new and stimulating interests with the eager assistance of our onsite staff." Very reasonably priced at $37 to $54/night short term stays and Good Sam discounts may apply. Extended stays for a month or more become very attractive. A 3 month stay starts at $1,700 plus electricity, about $20/night. First time visitors even get a bigger discount! We only paid for 2 months as first timers for a 3 month winter stay.